It's Good Friday, and a crowd has gathered around a horizontal table-top tomb in the tiny churchyard of St Bartholomew the Great, London's oldest parish church, which stands on the northern fringe of the City of London. The most noticeable thing about this motley gathering is that the majority of those present consist of a group of twenty-one, very old and very feeble widows. Twenty-one of them to be precise. A churchwarden steps towards the grave. He stoops down and places a silver sixpence upon the tombstone's grim-coated surface. As he straightens himself, one of the poor widows clambers onto the grave, kneels down, and proceeds to pick up the silver sixpence. Another gentleman then hands her a hot cross bun, while a further member of the company extends a steadying arm towards her, which she holds on to as she proceeds to walk across the grave. Once she has stepped down, the churchwarden comes forward once more and lays another sixpence upon the grave, whereupon a second widow hobbles up and repeats the ritual. And, one by one, so do the other nineteen poor widows, until each one of them has collected a sixpence and a hot cross bun and has shuffled across the timeworn slab. 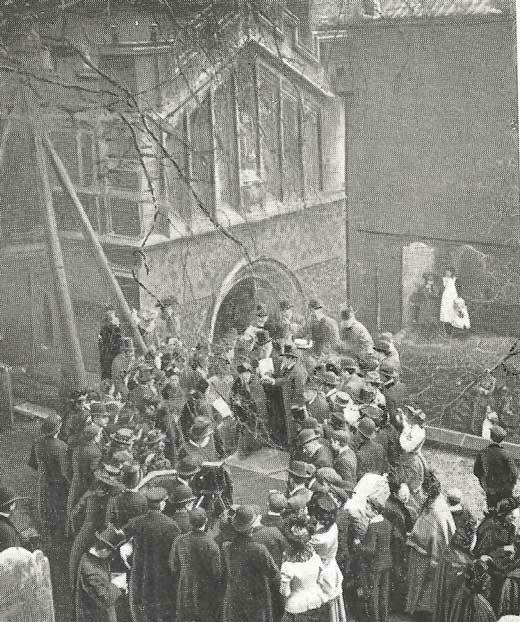 The ceremony described here took place on Good Friday 1902 and was described for posterity by Desmond Young in George Sims's exhaustive study Living London. Mind you, you don't need to dig into the dusty old pages of of yellowed books to find out about this strange custom because, with a few moderations, the ceremony is still performed today and you can, if the mood takes you, attend and witness the whole thing first hand, albeit, poor widows are conspicuous by their absence. The custom of distributing hot cross buns and silver sixpences to the poor widows of St Bartholomew's parish is an ancient one, and was once known as the "Widow's Sixpence." 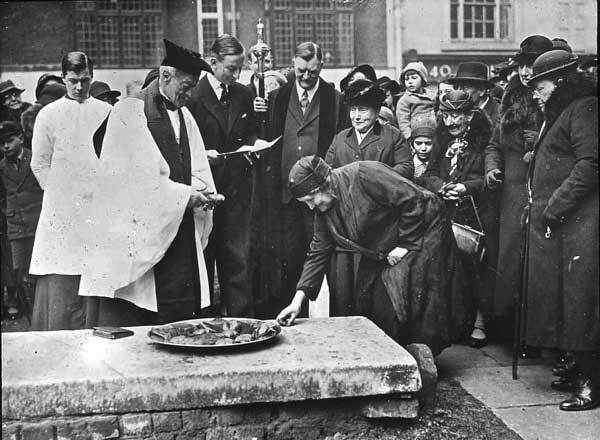 According to Living London the ceremony "which for centuries has been carried out practically as it is at the present time, began through the terms of a bequest by a widow whose remains lie under the stone." However, in 1887, legal publisher Joshua Butterworth established a trust to ensure the ceremony's future by establishing a trust in the sum of £21 and 10 shillings. He also instructed that the charity, once established, should ever after be referred to as "The Butterworth Charity." With the dawn of the 20th Century - and the decline in the value of a sixpenny piece - the amount distributed was increased to 2 shillings and Sixpence (half a crown) and then, later in the century, it increased again to 4 shillings. Nowadays, it is poor widows that have declined in the parish, and so the rector is the one who now clambers up onto the stone and enquires of the milling throng if there are any poor widows present who are in need of 20 shillings. Apparently, in 2013, one lady did indeed raise her hand, but such interruptions are, on the whole, rare these days! A sermon is then given, followed by a hymn and then, starting with the choir, the churchwardens move around the churchyard bearing baskets of hot cross buns which are eagerly devoured by clergy and congregation alike. And, once ravenous appetites have been sated, the crowd disperses and the widow, who ever she be, is left to her repose for another year. You can visit the churchyard of St Bartholomew the Great, and hear more about the Butterworth Charity, on our Secret London Walking Tour.